After many years of touring with her sister-in-law the late great Denise LaSalle Karen felt she it was time to step back into the lime light as she promotes her new single releases "That Chick Ain't Me" and new release "Girls Night Out"
Karen Wolfe – The Queen of Soul Blues has transition to new record label Sweet Success Records LLC with a new sound, new attitude but with the same powerful show. 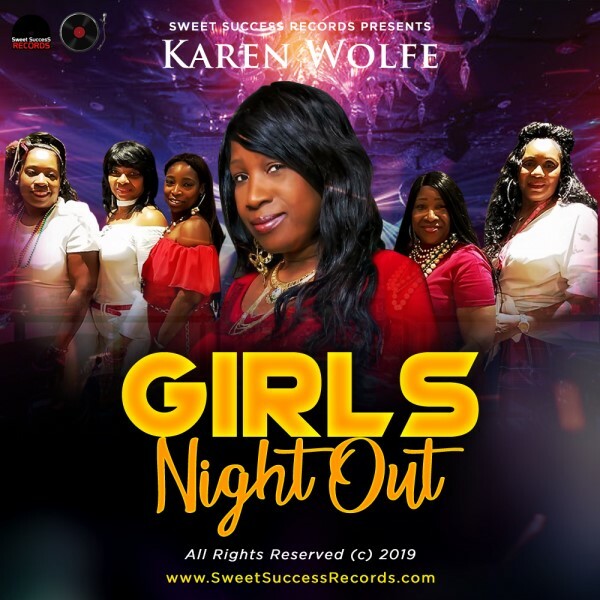 Right out the blocks Karen’s new single entitled “Girls Night Out” is evident on how determined she is on changing the Soul Blues genre and crossing it over to also R&B Soul to allow the genre to breath and expand. Sweet Success Records (SSR) in conjuctions with CODAY recording artist “Karen Wolfe” is no newcomer to the world of Southern Soul & Blues. However, “Karen Wolfe” recorded her first album with a Gospel Quartet group called “The Harmonettes” the CD was titled “Stop By Here”. The group later changed their name to “Direction” and went on to record their sophomore CD that was titled “God Don’t Make Mistakes”. After the group dissolved, “Karen’s” musical career took a change in direction. “Karen” joined the Soul & Blues arena by singing background behind the Queen of the Blues, the Legendary Denise LaSalle. After listening to “Karen” sing, B & J Records Executives, the Late Bill Coday (Get Your Lies Straight) and Anna Neal Chew (at that time Denise LaSalle’s Road Manager) approached "Karen" about signing a record deal with their Label, B & J Records (now Coday Records). In 2006 they released the CD “First Time Out”. The lead off song “Back Door Love Affair”, which was written by her label mate, Mr. James Smith, was the first Soul & Blues hit. Nationwide (BlackNews.com) -- Karen Wolfe – The Queen of Soul Blues has transition to new record label Sweet Success Records LLC with a new sound, new attitude but with the same powerful show. Right out the blocks Karen’s new single entitled “Girls Night Out” is evident on how determined she is on changing the Soul Blues genre and crossing it over to also R&B Soul to allow the genre to breath and expand. Karen Wolfe aka the "The Queen of Soul Blues" is no new comer to the music world as she has travelled and toured the world with the late great "Queen of Southern Soul" Denise LaSalle where she really learned how to own the stage. Karen has performed with past and current legends as Bobby Rush, T.K. Soul, Floyd Taylor, Jeff Floyd, Willie Clayton, Sheba Potts-Wright, Mel Waiters, James Smith, Terry Wright, and Andre' Lee to name a few. Karen has also shared the stage with some Late Great Legends: Bill Coday, Marvin Sease, J. Blackfoot, Tyrone Davis, Little Milton and Johnny Taylor just to mention a few. Karen's music career hasn’t always been peaches and cream as it dates back to when she recorded her first album with a Gospel Quartet group called The Harmonettes, the CD was titled "Stop by Here". After some ups and downs the group later changed their name to "Direction" and went on to record their sophomore CD that was titled "God Don't Make Mistakes". Over the years the group finally dissolved, and Karen's musical career took a change in direction. Karen joined the Soul & Blues arena by singing background behind the Queen of the Blues, the Legendary Denise LaSalle. Karen got her groove and after hearing her sing, executives from B & J Records now Coday Records signed Karen to her first record deal and her first release CD "First Time Out" in 2006. In 2009, is when the stars began to line up when she released the CD "A Woman Needs A Strong Man" which held the hits songs Southern Soul Party Mood and "Man Enough". These two songs gave Karen global air play and the opportunity to travel and do countless live shows in numerous cities. 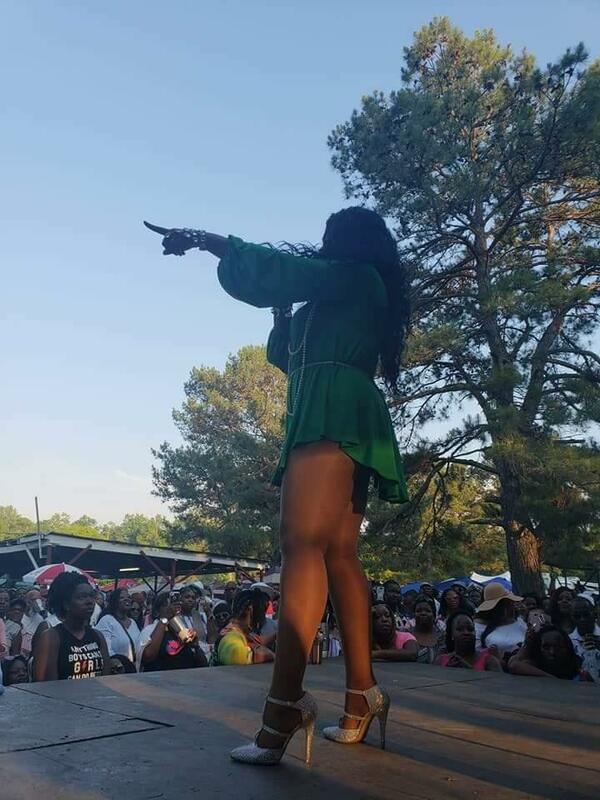 "Man Enough" has also become a woman's anthem for real women around the country and possibly around the world while Southern Soul Party Mood was loved all throughout the Line Dance community. Now she was rolling with the release of her single ballet "Stuttering" she had another national hit on her hand off the 2012 CD release "Telling It Like It Is." Karen was an up and coming force. Finally, at the end of 2017 she released her first of two song entitled "That Chick Ain't Me" to respond to her super hit "Man Enough" which her fans realizing the Karen was never gone. At the turn of the year in 2018 rolling right out with her second release entitled "You Ain't Woman Enough" and if you haven't heard it then you need to log onto somebody's station and listen because it's fire! This song to answer any question to anyone who had any doubt that Karen Wolfe wasn't still on top in the music industry you had better ask somebody!